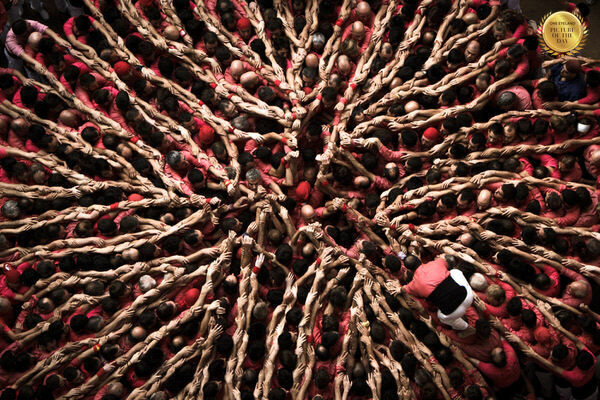 "The Sky Of Human Towers"
"Members of the "Colla Vella Xiquets de Valls" team prepare the base of their upcoming human tower during the "XXV Concurs de Castells de Tarragona", one of the biggest human tower competition in the world. During the event, that takes place only once every two years in the region of Catalonia, Spain, each team builds its own human towers, which are between six and ten levels high. For their success, a crowded and stunning base of hundreds of people needs to be previously perfectly set up. Human towers (known in Catalan as "castells") have been one of the most important cultural traditions in Catalonia for more than 200 years and have become part of the identity of Catalan people. ���? ?Strength, balance, courage and common sense���?? is their motto."